Darwin is a standalone EDI solution for (smaller) businesses that want to make use of electronic data communication but do not, for example, have an ERP system at their disposal or do not want to integrate their data traffic. EDARWIN now fully facilitates EDI-related process handling in the ERP packet. DARWIN translates all your EDI messages for you so that you can easily read or print them. It supports various message standards (such as ODETTE, VDA, EDIFACT, ANSI and EAN) and communication protocols (such as (S)FTP, AS2, OFTP(2) and X.25). All you need is an Internet connection. DARWIN will take care of the rest. This standalone solution is already widely used in the automotive industry. 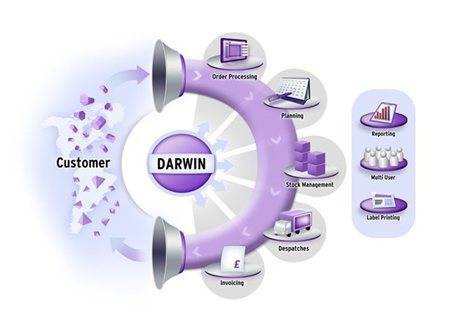 If you choose to use Darwin, you will not have to invest in EDI integration in your ERP software. The only costs are for installation and licensing. In addition, you will pay a monthly fee for data traffic if you also make use of DINET. If the system is implemented across the board, you will save on administrative costs as well as logistical process costs. You will be able to reduce your inventory, payments can be made earlier and you will be able to react more quickly to changes in the market. Would you like more information about DARWIN, the EDI Workstation? Our EDI experts are happy to help.